Smyrna Mayor Max Bacon welcomes Jean Brannon, his fifth grade teacher, to the State of the City address in July. Smyrna is the hottest spot to live in the metro area according to Mayor Max Bacon. Bacon addressed an overflow crowd at the annual state of the City Address for the Smyrna Business Association and Smyrna Division of the Cobb Chamber in July. “We will not raise taxes,” the mayor told the crowd. Smyrna will maintain the millage rate of 8.99 mills for 2017. This rate has been in effect since 2007. Homeowners who maintain a primary residence in Smyrna and have filed for the floating homestead exemption will not see a tax increase on their 2017 property tax bill. Smyrna has a AAA bond rating, one of only six in the state. 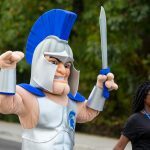 The city’s $92 million budget is broken down by: public safety, 38 percent; general government, 21 percent; Public works, 18 percent; debt 9 percent; parks and recreation, 8 percent; community development, 3 percent; library, 2 percent and Keep Smyrna Beautiful, 1 percent. Early this year Bacon admitted that he had a heart condition. 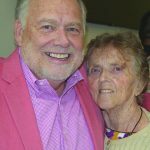 After being referred by his family doctor, Bacon said, “My doctor was wrong, I had not had one heart attack, I had two,” he said. He had two stents installed and has since recovered. The health scare has brought up questions of whether Bacon, who has held the mayor’s job since 1985, will run for another term. “Am I going to run again? Right now I’d say yes, because I’m not going to tell you no,” he said. Bacon noted that the Belmont and Jonquil developments are essentially done, although some storefronts are still being built out. Belmont is a 48-acre mixed-use development with homes, apartments, retail, restaurants and Smyrna Elementary. The Belmont Physicians Center is under construction on Windy Hill and David Weekly homes will build a second phase of houses along Atlanta Road. Jonquil, anchored by Publix, is an 11 acre mixed-use site in downtown Smyrna including apartments and retail and restaurants. “Concord Road is finally finished,” he said. The $12 million SPLOST road widening project on Concord Road is complete, he reported. The Downtown Development Authority sold one property to a restaurant and many parcels on the north side of Concord is being developed as a passive linier park. The next road project is the Windy Hill Road improvement that will begin next year from South Cobb and Atlanta Roads. “Windy Hill will be an express route,” he said. Four express lanes will move east-west traffic with frontage roads on each side. “It’s going to be a mess for the next five years,” he said. “The Reed House will top my list of things I am proud of,” he said. The city purchased the home on Atlanta Road for $18 million and will spend $1.3 million renovating it to use as an event facility. “This is going to be a great addition once it is finished,” he said. 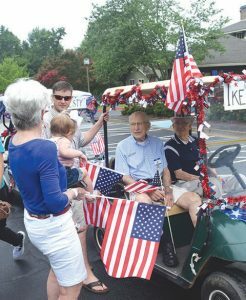 Presbyterian Village in Austell held its annual golf cart parade to honor the Fourth of July with more than two dozen golf carts decked out in patriotic bunting. 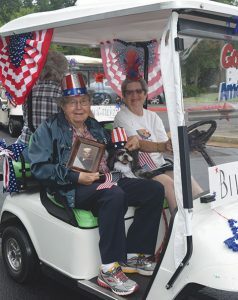 Where in previous parades there has been a Grand Marshall seated in the lead car; this year some 14 World War II veterans were honored as Grand Marshalls, riding in individual carts. Among them was, below left, Navy veteran Bill Smith, a pharmacist’s mate 3rd class, who served aboard the USS Wyoming in WWII. 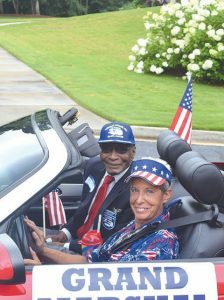 Hilliard Pouncey, right, an original Tuskegee Airman, rides in the lead car as one of more than a dozen “Grand Marshalls” at the annual golf cart parade at Presbyterian Village in Austell on July 3. 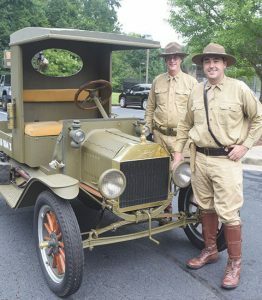 Bringing up the rear in a 1915 Model T, below right, are Robert and Bryant Brough of Mableton in vintage uniforms to honor the veterans. At left, Ike Strueusee, an Infantry Staff Sgt. during the war, fought at the Battle of The Bulge in the Army. Wearing orange full pressure “pumpkin suits,” the astronauts turned and waved one last time before boarding the space shuttle. Cameras snapped; parents waved, and with that they were locked in their home for the next 27 hours. Meanwhile, mission control began to work through the calculations and systematic steps to send a shuttle into space. The clock in the room ticked down to launch time. A television monitor featured a split-screen of the astronauts, now wearing helmets, as they prepared to embark on an out-of-this world lesson. The student astronauts and their teammates in mission control were part of the 19th mission to space for the Russell Elementary School Space Program, which first launched in 1998. The unique space program sends student astronauts on a simulated space mission inside a replica NASA shuttle. The space mission includes a launch, landing, payload deployment, spacewalk, onboard experiments and around-the-clock monitoring of onboard systems from the school’s mock mission control center. Students in the space program start in August to prepare for launch day. That’s not all the students learn. Grueling, that’s how Laster described the material the students learn over the course of the eight months leading up to the space launch. “All the kids learn how to read acronyms from NASA. They have to learn how to read flight plans and time stamps,” explained Tracey Steiner, a Russell science, technology, engineering and math (STEM) lab teacher. The students tackle the grueling material after school hours. Some of the students spend four days a week for several hours each day preparing for their space mission. The teaching staff help the students develop the math and science skills to understand the different systems aboard the space shuttle and the complexities of the spaceflight operations. Some of what Samantha learned shocked her, for example, reading about the lack of privacy and bathrooms in space. Samantha was motivated to join the space team by the stories her brother shared about the program when he came home every day. He was a member of the space team a few years prior. Samantha’s fifth grade classmate Joy also made the space team a family tradition. Joy’s two sisters are both veterans of the Russell Space Program. Her sister, Princess, was there for Joy’s launch day as commander of the STS-19 team. “The fact that she was able to buckle down and do all that work and reach the point where she is actually commanding the [space team] is wild,” Princess said. The older sister has regaled stories of her time in the space program with her new college friends, who she said are shocked that her elementary school has such an elaborate space program. “I loved the program, and I love how it is growing,” Princess added. “Mission control looks a lot more realistic. Princess, who is studying biochemistry and molecular biology at the University of Georgia, credits the space program for impacting her interest in science. Joy and Princess’s dad credits the space program for helping his daughters excel in school. The proud father studied the material with his daughters, but has a confession about wanting to actually join the space team himself. Students in the space program have gone on to be chemical engineers, high-ranking service members and business owners. According to Laster, one space program veteran and graduate of the Georgia Institute of Technology will soon be writing orbital trajectories and trajectories for space probes. This student, too, credits the space program for propelling him on his career track. Steiner, who has flown on 10 space flights with students, has a theory about why the space program encourages student success. The students who join the space team undergo a rigorous application process including physical fitness tests. The student astronauts earn the top fitness scores. Although the students must have high grades to join the team, Laster sometimes sees something in a student that others may not. He said that after some students join the program, they start to thrive and do things that they didn’t even know were possible. Princess still keeps up with the friends she made on STS-10 mission. The students cite varying reasons on why they want to enlist in the space program, but their teacher only has one. “I’m here for the kids,” said Laster. He launched the space program after taking Russell students on a trip to the U.S. Space and Rocket Center in Huntsville, Ala. A student asked why Russell Elementary couldn’t have a space program like the one in Huntsville. That question started the countdown to the school’s first space mission. 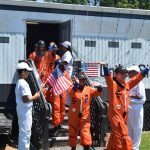 The program started off in the classroom and moved into the separate simulator set up in a trailer outside of the school, which is painted to look like a NASA space shuttle. Steiner, who hung up her pumpkin suit for the last time after the STS-19 mission, described the space program as the heart and soul of Russell Elementary. After STS-19 landed on May 9, the astronauts and mission control reunited and celebrated with a parade through the school. There is a lot of emotion that takes place with the students, parents and teachers on landing day, according to the dad of three veteran space team members. “There are a lot of tissue boxes being used. Even people who think they never cry, they always end up in tears,” Dikko said. There was a lot to celebrate this year. About three minutes prior the shuttle landing, a power surge knocked out power in mission control and the simulator. The school staff does sometimes inject malfunctions so the students can use their skills to overcome challenges. This was not a drill. After all the excitement of the landing, the STS-19 team had a lot to discuss during the school press conference. The entire school gathered in the cafeteria to listen to the team answer questions about their mission. From the June 2017 issue of The Bright Side, Cobb County Georgia’s Newspaper covering Smyrna, Vinings, Mableton, Powder Springs and Austell, GA. 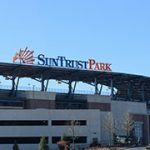 The last of the cranes used in the construction of SunTrust Park was removed at the end of March and two preseason games have tested the staff operations, passing with flying colors. The Atlanta Braves are ready to open the season in their new home in Cobb County on April 14 against the San Diego Padres. “This was a five to eight year project done in 30 months,” Mike Plant, president of development, said. Construction work, and cranes still are completing The Battery, an entertainment district venues, restaurants, 200,000 sq. ft. of retail and apartments adjacent to the park. McGuirk said that some 150 of the planned apartments are finished, and leased. “It’s sort of a millennial heaven,” he said. Construction on the Battery will continue throughout the summer with the The Omni hotel opening by Thanksgiving and the Comcast office building by late summer. The first concert at the Roxy is April 7. “By the end of the year everything will be open,” he said. Local fans are looking forward to being a part of the new ballpark. The Smyrna First United Methodist Church’s youth choir, God’s Light, will perform the national anthem on April 19. “They do it every year but this one is particularly exciting since it’s in our own backyard,” said Julie Lischer. 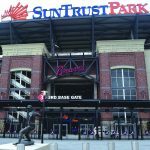 SunTrust Park was designed as a fan’s ballpark, with good sightlines and an intimate feel. “The advantage of this orientation is that from the upper deck you can see the Atlanta skyline,” said Joe Spears, architect. Another unique feature is the connectivity available at the park. With Comcast next door, and wi-fi repeaters located at numerous spots around the field and in the seats, fans can enjoy free high speed wi-fi. 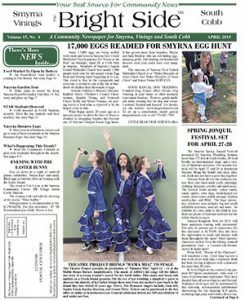 From the April 2017 issue of The Bright Side, Cobb County, Georgia’s Newspaper covering Smyrna, Vinings, Mableton, Powder Springs and Austell, GA. Opening Day is April 14 and there’s more on the menu at SunTrust Park than just peanuts, popcorn and Cracker Jack. The ballpark’s concessions are provided by Delaware North Sportservice – a division of global hospitality and foodservice provider Delaware North. Other food vendors include Chick-fil-A, Waffle House and Fox Brothers Barbeque. 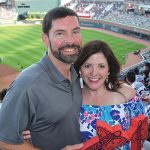 “Like the ballpark, the food service is state of the art,” said Shawn Mattox, Delaware North’s general manager at SunTrust Park. A variety of themed outlets will provide regionally inspired, fan-favorite dishes using local ingredients and companies. The “Taste of Braves Country” program will feature traditional items from around Georgia and five other neighboring states considered “Braves Country,” while a “Farm to Fan” initiative will bring fresh, homegrown ingredients to the ballpark from Atlanta-area farms and other local producers. He noted that for a family of four you might expect to budget about $60 for a meal during the game. A kids’ meal of a hot dog, chips and a drink is $7. Georgia: Fox Bros. BBQ; Hugh Acheson 1st & 3rd Hot Dog and Sausage Shack, Chick-fil-A; Waffle House. South Carolina: Pimento Cheese Patty Melt, served with caramelized onions and smoked paprika on rye. North Carolina: Smoked whole hog BBQ sandwich, served on white bread with chopped southern slaw and vinegar BBQ sauce. Tennessee: Nashville Hot Chicken, served with bread & butter pickles. Mississippi: Blackened Catfish Po’ Boy Taco, served with slaw and Comeback Sauce. Alabama: Fried Tomahawk Pork Chop, served on an extra-large potato roll with collard green slaw and white BBQ sauce. 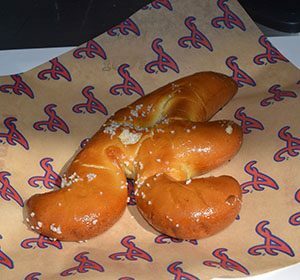 “Braves fans come from far and wide, and each one has a different and delicious food they enjoy while watching a baseball game,” said Shawn Mattox, Delaware North’s general manager at SunTrust Park. “We designed a menu that underscores the diversity of southern cooking and created dishes that we know all fans will enjoy while in Atlanta for a game. For its Farm to Fan initiative, Sportservice will draw from a network of more than 40 Atlanta-area farms, urban and college gardens, and other local producers to incorporate their produce into a variety of concessions dishes. The produce and fresh ingredients will vary throughout the season based on market availability and each game will feature a different farm or local company. A guest farmer component will also bring the farmers to the ballpark to work alongside Sportservice chefs and meet with fans as they try the locally sourced dishes. Fans can look for the Farm to Fan logo at concession stands throughout the ballpark to try the featured produce item of the game, or follow on social media as farms and participating concession stand locations are announced throughout the season. Despite the myriad choices of food at the ballpark, the Braves will allow outside food in SunTrust Park, reversing an earlier announcement. The organization initially said no outside food or drink, except a sealed water bottle, would be allowed into the new stadium. Just before the March 31 preseason game, the Braves tweeted that, after receiving feedback from fans, they have changed that policy. “Over the past few days we have heard feedback from our fans expressing their desire to continue to bring food items into the ballpark on game days. We listened and have decided to amend our approach,” the organization posted on Twitter. Fans will now be allowed to bring food inside SunTrust Park as long as it fits inside a clear, gallon-sized plastic bag. Fans may still bring a sealed plastic water bottle. “One bag of food and one bottle of water per ticket will be permitted,” the tweet said. All bags of food are subject to additional inspection. Exceptions to the policy will be made for those with dietary concerns and infants. First pitch at the Braves’ new SunTrust Park is next month, but already the economic benefits are being felt, not only in the Cumberland area, but across southern Cobb County. Cobb Chamber President David Connell noted that Cobb will soon be home to three professional sports franchises. Preceding the Braves’ relocation to Cobb was the Atlanta Blaze, a professional men’s field lacrosse team based in Kennesaw, while Arthur Blank’s Atlanta United Football Club is building its headquarters and training complex on a 33-acre site on Franklin Gateway in Marietta; the soccer team will begin play this spring and eventually play its home games at the Atlanta Falcons’ new Mercedes-Benz Stadium. Six Flags and White Water expect an attendance boost from Braves fans. “District 4 (southwest Cobb represented by Commissioner Lisa Cupid) has been leading the county in permits for the last six months,” said Cobb Commission Chair Mike Boyce. “There’s a lot happening there – new homes, new business. South Cobb is in a great position because there’s a great infrastructure already in place. Other parts of southern Cobb are working to get their piece of the pie. 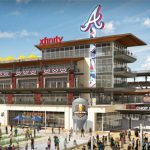 “We hope to market the area as a pit stop for travelers to the Braves’ games,” said Stephanie Aylworth, economic development coordinator for Powder Springs. Powder Springs is looking at future downtown plans and funding. Mayor Al Thurman said he favors building upscale apartments in downtown to draw more businesses. City officials are reviewing several plans which would involve the investment of $3 to $5 million for “a public amenity” in downtown with its design and location not yet determined. Austell is looking toward housing for new residents and working to improve its downtown. “We want to re-activate our downtown,” he said. Using data from Georgia Power economic development, the city realized that it was losing millions of dollars in a 15 mile radius from Austell residents. The city worked to reactivate the Austell business Association. Austell has purchased several holdings in the downtown area, renovating them and marketing them to new business. Two of the newest businesses are in city-owned buildings. Oz Antique Market opened the end of last year, and South Cobb Diner, a second location for West Cobb diner, is expected to open in the next couple of months. The biggest growth is in the Cumberland area. “Residential developments are being constructed at an all-time high right now in Cumberland,” Rivers said. These new residential developments cause a 71 percent population increase over the next 10 years in Cumberland. 6 office, 5 retail, and 5 hotel projects. 625,500 square feet of new retail. 1.7 million new square feet of Class A office space delivered by 2017. 6,806 housing units bringing more than 13,500 new residents. $2 billion in public infrastructure improvements in and around Cumberland. 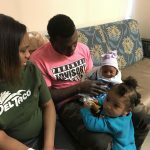 From the March 2017 issue of The Bright Side, Cobb County Georgia’s Newspaper covering Smyrna, Vinings, Mableton, Powder Springs and Austell, GA.
Cobb County’s first baby born in 2017 arrived at WellStar Cobb Hospital in Austell at 12:02 a.m. Jan. 1, hospital officials say. Jayce Hanna is 7 pounds, 1.4 ounces and 20 inches long. The baby boy was born to parents Verneka Hodo and Chevron Hanna of Austell. He was also welcomed by a big sister, 1-year-old Journey. From the January 2017 issue of The Bright Side, Cobb County Georgia’s Newspaper covering Smyrna, Vinings, Mableton, Powder Springs and Austell, GA.